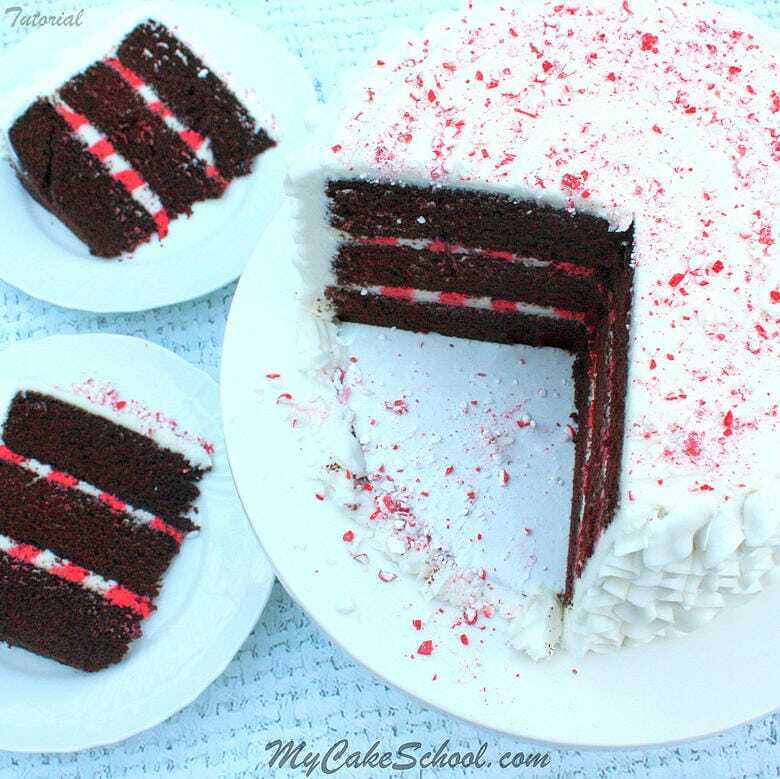 Today I’m going to share an amazing Chocolate Candy Cane Cake with Striped Filling Video Tutorial! Not only are chocolate and mint made for each other, (one of my favorite combinations of all time), but this adorable Christmas Cake tutorial will show you how to make a festive striped buttercream filling that is sure to wow your guests. Everybody loves a surprise! This moist and delicious chocolate cake with flavorful peppermint buttercream will be the hit of the party, and the unique striped buttercream filling is a super easy method that can be applied to cakes for all occasions. The striped buttercream filling is so unexpected that it always brings smiles when the time comes to slice the cake! I use this striped buttercream technique for cakes year-round. This cake is made up of our decadent classic chocolate cake layers and is filled and frosted with a delicious (and easy) peppermint buttercream. If you are a fan of chocolate and peppermint, you are just going to fall in love with this fantastic recipe! For our full collection of Christmas and Winter Cake Recipes, Tutorials, and Inspiration, don’t miss our Roundup of FAVORITE Christmas and Winter cakes! We’ve made tons of Christmas and winter-themed cakes over the years, as well as many tried and true recipes! There is something for everyone! Have fun with this Candy Cane cake, and don’t forget to check out our notes and cake recipe links below! 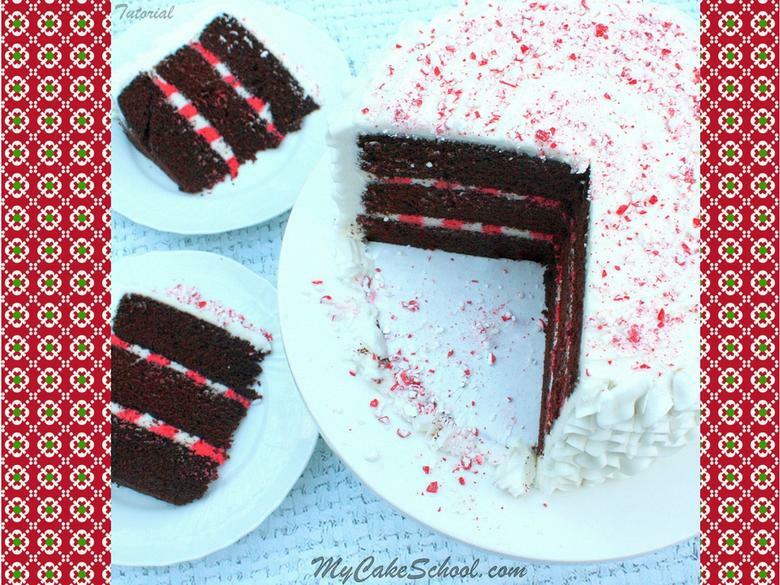 We used THIS Scratch Chocolate Cake Recipe and THIS Peppermint Buttercream Recipe for our Chocolate Candy Cane Cake. This flavorful peppermint buttercream recipe has just the right amount of mint, and complements our most favorite moist and delicious Classic Chocolate Cake perfectly! If you prefer to work with doctored cake mix recipes, check out our Chocolate Sour Cream Cake (doctored mix) Recipe! Spatula- I’m using a small, rounded angled spatula. Use whatever you like! After filling my piping bags with red and white buttercream, I snipped away the end of the bag to create a small hole, maybe 1/4-1/2 inch wide. (Adjust to your liking). When piping by circles, I held that the piping bag slightly above the surface of the cake so that the frosting would be a bit thicker. If your filling is very thin, the red and white effect will not be as visible in between the layers of cake. We decorated the top with crushed peppermints. Oh dang it, where’s my apron? Haha thanks Scott! Merry Christmas to you! Thanks for your beautiful and for shure delicious quick Cake red and white! Wow Melissa. That is so pretty. Really!! How do u come up with these ideas? Do u get dreams ? cool I will try this design with other flavors as well. Great idea. Thank you for the video, it makes it look so easy.